Your 4th house of home and family became strong on the 20th of last month and is strong until the 21st of this. This is the time to get the home and domestic situation in right order. Many important and good changes are happening in the career, but your focus should still be on the home, family and emotional life. When you are in emotional harmony and coming from this place, the career will naturally blos­som. Your spiritual mission is still your family, as it has been all year. After the 27th, as Jupiter moves into Cancer, the family is still important, but there is more focus on the chil­dren or children figures in your life. Your mission is to be there for them. The element of Water becomes unusually strong after the 21st. We have a situation similar to February and March; 60 to 70 per cent of the planets are either in Water signs or moving through them. People are more emotional and feeling-oriented. The emotional energy on the planet is much stronger than usual. (Often there is more rain and sometimes flooding under these aspects.) While you are very comfortable with a lot of water, you must make sure that your feelings are positive and constructive. When they are positive, you will create and experience heaven on earth. When they turn negative you will understand the seven circles of hell. Be on guard now. For those of you on the spiritual path there are important metaphysical implications here. A successful prayer or medi­tation is when you succeed in entering the feeling of what you are praying for. When this happens, the prayer is answered. Now, it is much easier to enter the feeling of what you want, thus you have more power to manifest what is desirable. Spiritual work will go better. Health improves tremendously after the 21st. You have all the energy you need to achieve whatever you set your mind to. Goals are achieved much easier now and with much less fuss and bother. You enter a yearly personal pleasure peak which will be stronger than your normal personal pleasure peaks. Jupiter also moves into your 5th house - a fun time. There will be many opportunities for love affairs although these seem non-serious. Those of you involved in relation­ships will have more fun with the beloved. Love is honey-moonish this period. 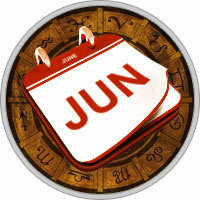 When Jupiter enters Cancer on the 27th you enter a cycle of good fortune. There is luck in speculations; there is fertil­ity for those of appropriate age; there is enhanced personal creativity. Fun kinds of travel will happen.Your 4th house of home and family became strong on the 20th of last month and is strong until the 21st of this. This is the time to get the home and domestic situation in right order. Many important and good changes are happening in the career, but your focus should still be on the home, family and emotional life. When you are in emotional harmony and coming from this place, the career will naturally blos­som. Your spiritual mission is still your family, as it has been all year. After the 27th, as Jupiter moves into Cancer, the family is still important, but there is more focus on the chil­dren or children figures in your life. Your mission is to be there for them. There will be many opportunities for love affairs although these seem non-serious. Those of you involved in relation­ships will have more fun with the beloved. Love is honey-moonish this period. When Jupiter enters Cancer on the 27th you enter a cycle of good fortune. There is luck in speculations; there is fertil­ity for those of appropriate age; there is enhanced personal creativity. Fun kinds of travel will happen.